- its a hard job but someone has to do it! Born in Kingston-upon-Thames, Christine Dando moved away from the UK when she was 3 years old. Christine’s family travelled extensively across Europe and Asia, eventually settling in Aden, Yemen. Having been introduced to the cosmopolitan life as a child, she attributes her early travels as an inspiration and passion for a world of design and love of beautiful things. Training in design, pattern cutting and dressmaking in Singapore, Christine was highly influenced by Charles and Diana's wedding in 1981 and opened her first bridal boutique in the UK not long after. 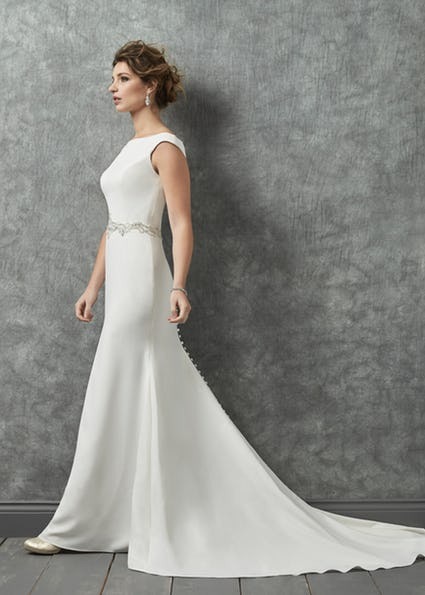 Dando London is the culmination of Christine's experience and passion which is poured into the style, cut, fit and hand finishing of each dress. Using the finest quality fabrics and lace we highlight attention to detail and make sure that our brides feel effortlessly beautiful. Drawing inspiration from a variety of diverse sources from Old Hollywood through to the natural world, her philosophy is to focus on the cut and fit of each gown to ensure our brides are comfortable. Romantica is a family owned and run British business since their inception/creation over 30 years ago. Through the eyes and drive of talented designer Sally Waddington, they know honesty, integrity and family values are incorporated in all the distinctive wedding dresses they produce. Starting out with Sally as the designer and factory manager and her husband Mike as Sales Director they set up with the assistance of 20 machinists in a small factory in the heart of the Devon countryside. They quickly expanded their brand over the coming years as the designs evolved, whilst keeping their core values central in all areas. Twenty years ago they moved to a larger premises, but they still operate in the Devon countryside and 3 more members of the family joined the business and continue to drive the legacy forward. Their dedicated in-house team bring a varied set of design skills and experience to the dresses. With expertise in different areas from textile design to pattern drawing, construction and draping, the team ensure each design is produced to an exceptional standard. Fabrics, laces and embellishments are hand-picked for each sketch allowing their designs to capture the romance and elegance of every style. Romantica’s designers are constantly drawing inspiration from the ever changing concept of the 'Wedding.' This allows them to keep up with bridal trends and themes whilst endeavouring to provide a range of dresses with a style for every bride.